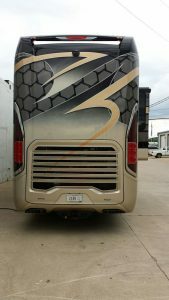 Newell has dramatically restyled their coaches multiple times during their 50 year history. During the spring of 2016, Newell has done it again with the new p50 Edition, in honor of their 50th anniversary. Beginning with coach #1600, a 2017 show coach, Newell has dramatically restyled their coach from every angle. Since words can hardly describe the transformation, I will supplement the words with comparison photos from early 2020P model coaches from 2017 (#1557, #1560) and the new p50 model coaches from late 2017 (#1600). Click on photos to see enlarged view. From the rear, the tail lights are lower and the bezel is taller and narrower, the high mount stop light is more pronounced, the rear engine grill is redesigned with more openness and the exhaust outlets are restyled. The overall effect is a clean, narrower look with almost a coke bottle waist appearance. 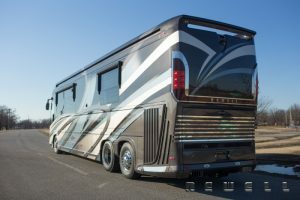 From the side, the engine cooling vents are more open and the slats are horizontal rather than vertical, the accent lines are restyled to give a more aerodynamic look to the coach, the bodywork between the drive and tag axle has been restyled. Note the revised accents on the entry door. In a way, the most dramatic change is the front end. The headlight assembly has been restyled, the lower valance has been modified around the driving/fog lights, the chrome grille highlights are eliminated, the center clearance lights are redesigned and incorporated into panel giving the impression of an almost stingray appearance above the windshield. One of the more striking changes is less obvious with a casual look. 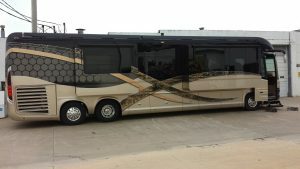 Most of the front of the coach is now glass. Yep, not a misprint, glass. The center of the front consists of three large panes of glass: 1) the windshield, 2) the large area between the windshield and the generator cover, and 3) the top half of the generator cowl. I understand that the Newell logo lights up. 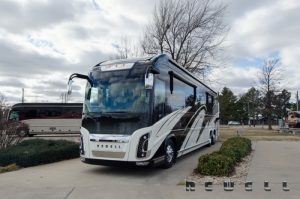 In addition to the styling changes, Newell has made changes such as remote-controlled power shore line reel, push-button exterior door latches and an electric-actuated entry door. 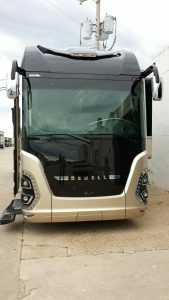 For more information on the exciting redesign, see Newell’s website at Newell Coach or better yet, contact Newell Coach to find out the advantages of owning one of these premier coaches. I have devoted a page to photos of the previous generations of Newells.